March Madness in the capital city is finally wrapping up, but not without plenty of excitement from fans as they celebrate the final games. COLUMBIA, S.C. — The Men's NCAA Tournament came to an end in Columbia on Sunday, but there was still plenty of excitement around the city as fans celebrated the last games in the area. At Carolina Ale House in the Vista, fans watched tournament games and prepared for another great day of basketball in Columbia. "I'm a Duke fan since sixth grade; I'm 45-years-old now. That's my team forever," Terry Glover said. "It's great for the city. Hopefully we can have this thing again." "We live in Dallas," James Wikman said. "Great city; we'll come back." 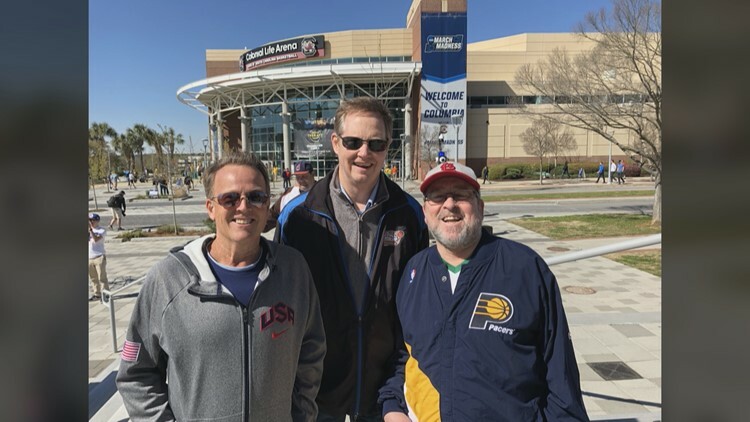 Wikman and his three long-time friends John Ries and Tom Bowen have been dubbed the 'basketball mavens' after Wikman says they've attended more than 400 tournament games. "We've been to over 460," Wikman said. "Sometimes we'll run into fans that this is [their] seventh year in a row," Ries said. "We'll go, 'amateurs.'" Fans who got a chance to go to Colonial Life Arena for the games also enjoyed their time in the Soda City. "We came down from Virginia and we ate a barbecue restaurant and it was awesome," said Jeffery Witt, who is a University of Virginia fan. "This is one of the best arenas I have ever been in for a basketball game." Fans also say they enjoyed seeing the rich history of the city and are hopeful the NCAA Tournament comes back to town. "We had so many fan bases here it was just a wonderful time to be from South Carolina," said South Carolina native Mark Dickson. As the tournament leaves the capital city, along with thousands of fans, locals prepare to go back to business as usual. "Tomorrow, it's back to the grind," Michael Johnson said, "but today we're just going to enjoy the sunshine and the basketball."